4 Commercial Real Estate & Properties in Buronga are listed in 3 categories. We have 2 Development LandsSale , 1 OfficesSale and 1 Industrial Warehouses Sale . 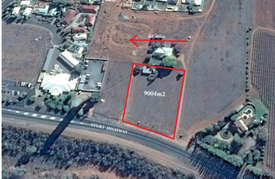 Commercial site 2, lot 28 Sturt Hwy, Buronga is a large 9004m2 allotment and is in an outstanding location with approximately 10,000 vehicles a day passing by it. There is truck access and plenty of room for a major building and car parking space. Commercial sites in this area are a rare find. Developer would further subdivide into smaller lots if required. Would suit super market, cluster of shops or fast food outlet (STCA).